Now you can take the glow of the spotlights anywhere you want with American DJ’s new Event Bar DMX. Compact and ultra convenient, the Event Bar DMX is an all-in-one LED scanning light system that features 4 bright white 3W LED pinspots mounted on an X-Y movement bar. A great “turnkey” lighting system for nightclubs, stage productions, concerts, mobile entertainers, retail displays, trade shows and special events, the Event Bar DMX is easy to set up and operate. It is also a very versatile lighting tool that can handle everything from illuminating a large dance floor, to table or cake spotting for that big wedding day or corporate event. Wherever it’s used, the Event Bar DMX will provide impressive high-impact lighting. 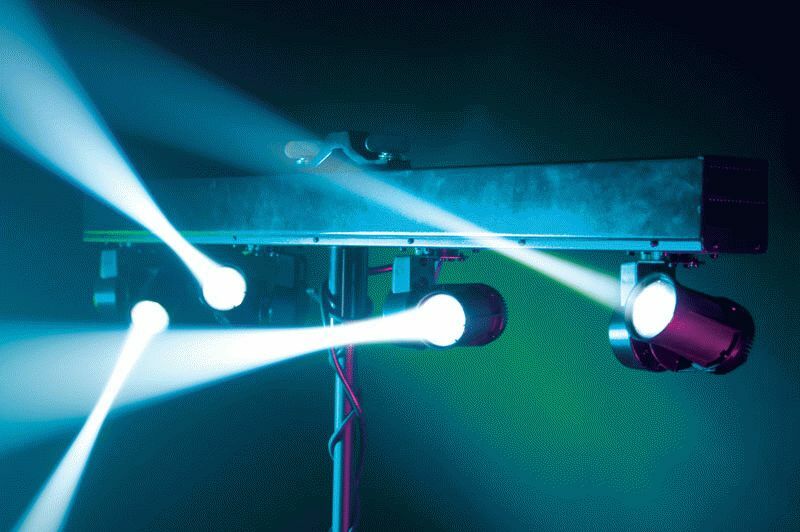 Featuring full DMX control, each of its 4 heads operates independently of the others and has its own strobe effect and 0-100% dimming capabilities, giving users the ability to create just the right mood and effects for any application. With a pan 360° and tilt of 270°, this 4-headed scanning system also provides broad, sweeping coverage with its brilliant white beams, so it’s ideal for illuminating spaces large and small. The lamps come with a standard 12° beam angle, but as an added option a 6° beam angle is also included, making the Event Bar DMX one of the most versatile bar-mounted lighting systems on the market today. Featuring both DMX and manual control, the Event Bar DMX provides a number of operating options that will appeal to novices and lighting pros alike. It can run in 4 different modes: DMX-512, Stand Alone, Sound Activated or Master-Slave. When in DMX Mode, it utilizes up to 25 channels and operates just like a traditional scanner in that users can control the pan and tilt on each individual head independently. The Event Bar DMX also features a number of exciting built-in programs that will amaze any audience when run in Sound Active Mode or when accessed as macros via DMX. Regardless of which mode you choose, the programs will run silky smooth and at an unbelievably fast rate, thanks to the unit’s 8 high-quality motors. A bright, user-friendly display makes it easy to navigate through DMX settings and access the internal programs. Equipped with 3-pin XLR connectors and 4-piece daisy chain power connect, the Event Bar DMX is also the perfect fixture to run in multiples at nightclubs and discos to create a very unique programmed light show at a fraction of the cost of using individual high-power scanners. Or to look at it another way, you can buy 4 Event Bar DMX systems for about the same price as 4 traditional scanners and get a similar look – only you get 16 heads instead of 4! Users can be assured that the lights will remain on long after the event is over, thanks to the Event Bar DMX’s long-lasting LED lamps, which will run for 50,000 hours at normal use, which means they can operate 24/7 for over 2,000 days before needing replacement! The LEDs also emit very little heat, and consume far less energy than conventional lights, just 54 watts at full operation. A perfect tool for those on the go, the Event Bar DMX is just over 3 feet long and weighs less than 17 pounds, so it can be easily transported and will take up very little space in a vehicle. It can be mounted either on a light stand or on truss with a clamp, giving lighting users plenty of setup options. The Event Bar DMX measures 39” x 3” x 8” (1,000 x 80 x 202 mm) and weighs 16.8 pounds (7.6 kgs.). It is fan-cooled and features multi-voltage operation: 100V-240V, 50/60Hz. The complete Event Bar DMX system has an MSRP of just $799.95.